This is number 4 on my list of Learning Theories That Actually Work. The most basic needs are on the bottom, and the idea is that you have to fulfill them before moving up to address the next level. (More details on the model here.) The critics chirp about what goes where, do you really need this before that, or does self-actualization--being the best person you can be--even work for more collectivist-minded cultures. Maslow himself eventually added a spiritual level at the apex, which never got much play. What does that mean? It means that learning always goes beyond the cog-and-gear realities of the world of work, beyond the need to learn this or that to be able to get this job to feed my family, or buy that particular roof I'd like over my head. Maslow's higher levels are always in play. Forget this at your own peril: Learning changes you. Always. So how is this practical? What do I, as a learning developer, do with it? You ask yourself early in the development process, "How will learners see themselves differently when they're done?" Then you build content and activities that help that happen. You establish identity-level outcomes. I'm not talking about trite statements like, "You're a safer person when you wear your safety goggles!" I'm talking about a portrait of success. Think about it. Why do people want to work in Silicon Valley? Why do they want to work on Wall Street, or join Greenpeace? These careers have a sense of identity that comes with them, one that everyone understands, and so they attract like-minded people. But the fact is, every job has that. Every field has a unique allure to those who sign up for it. You can tap into that allure, the one that draws those who actually find it irresistible... and you can use it. I get it if you're creating degree programs, you might say, but how can this possibly be true if I'm training Walmart employees to do inventory? My answer would be that if that's what you're doing, you have even more reason to focus on identity. Remember my theorem. All learning events have identity-level outcomes. Those learners will find identity-level outcomes themselves. Here's one: "Wow, look at me. I have become the guy who does inventory at Walmart. How did this happen?" See how that works? What you are learning to do is what you are becoming. No exceptions. But here's the flip side, actually the A side, the positive side: Walmart has a mission, too. Their mission is, "Saving people money so they can live better." Does that sound like a waste of time to you? Or does it sound like a worthwhile goal? Is it worth getting up in the morning and going to do inventory if that is a part of helping people live better? Your training should explain how doing inventory contributes to that end; not in happy talk, but with data. With actual stories. With reality, big picture and small. And why can't your training highlight what success looks like in a Walmart employee (See Social Learning Theory for more on this). The point is, if you don't know what your identity-level outcomes are, you are the only one in the dark. You can be sure your students/trainees/learners do, if only intuitively. So, speaking of doing inventory, let's go through my list of criteria for being a Learning Theory That Actually Works. 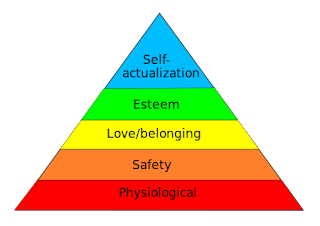 The whole reason Maslow has been around for 7 decades, and will likely outlive us all, is that it makes sense on the face of it. If I'm a learner, I'm not paying attention if I have to go to the bathroom. And I am motivated by a need to be accepted, to find my peer group. It's just logical, even if holes can be shot in in it here or there by researchers. Here's a 2011 report on research confirming Maslow. And here's one from 1976 questioning Maslow. You get the point. There's a lot out there. It's been studied, tested, used, abused... but it hasn't gone away. I've found it easier on the bottom and top levels than in the middle, but that's enough to qualify it for my list (the middle is very doable, however... think group dynamics). I've covered the top levels. At the bottom levels, learners need to feel safe and secure, with limited distractions. Take breaks, serve snacks, point out the bathrooms. If your training is online exclusively, keep their accounts and passwords and profile data secure! One story. When creating a Nursing master's degree for a well-known online university, we explored the motivators of nurses, and found that nurses in our target audience felt guilty about leaving the floor. Their work identity was wrapped up in taking care of patients. But after ten or fifteen years, they were worn out, burned out, thinking about money for their kids' college. So in the very first lesson of the very first course, we invested in a video that had a message from top nurse executives and conference speakers, which boiled down to: "All the things that you now do for six patients a day, you can do for 60. Or 600. Or 6,000. This is what it means to be a nurse executive or a nurse educator." We created an identity-level objective, focused on an identity-level outcome, and we played that theme out in course after course. The result was amazing. We passed the initial nursing accreditation review with zero deficiencies. Our own faculty were blown away by that--they'd never heard of zero deficiencies for an on-the-ground Nursing master's degree, much less a fully-online one. And the ongoing results were outstanding as well, as reflected in very low attrition rates. He may be old and slow, but Maslow makes the difference between good and great. He can play on my team any day.